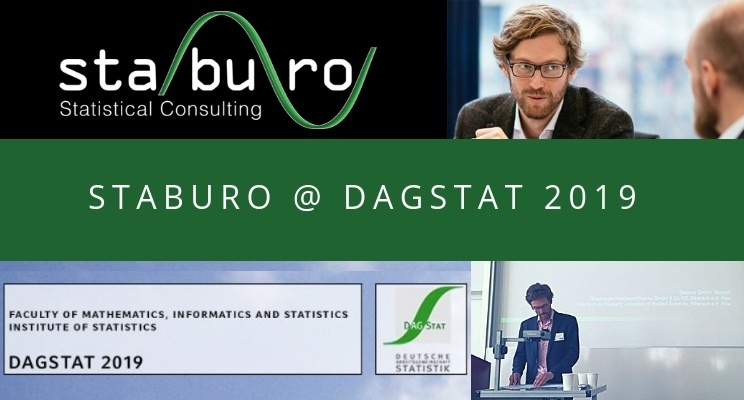 Several Staburo statisticians attended the DAGStat Conference 2019. The fifth conference of the Deutsche Arbeitsgemeinschaft Statistik took place in the heart of the Bavarian capital, Munich, from March 18 – 22, 2019. According to the motto “Statistics under one umbrella” the conference was organized as a joint meeting of the “Deutsche Arbeitsgemeinschaft Statistik”. The meeting includes the 65th “Biometrisches Kolloquium” and the spring meeting of the “Deutsche Statistische Gesellschaft“. Adaptive designs in clinical trials was one of the recurring topics of the conference. Staburo statisticians attended the tutorial on adaptive designs given by Prof Dr. Frank Bretz from Novartis Pharma GmbH and Prof. Dr. Tim Friede from the University Medical Center Göttingen. The tutorial discussed blinded sample size re-estimation and covered principles of group sequential and adaptive designs. Regular guidelines were discussed by Dr. James Hung of the U.S. Food and Drug Administration. State-of-the-art methods of adaptive designs were further discussed in several conference sessions on Design of Experiments and Clinical Trials. Valuable input on the view of regulatory agencies on current hot topics in regulatory statistics was provided by PD Dr. Benjamin Hofner from the Paul-Ehrlich-Institute. Dr. Hannes Buchner, Managing Director of Staburo GmbH, was also presenting on “A Novel Approach to Outlier Identification in Bioassays” on the conference. We thank everyone, who joined the talk, for their attendance and interest! If you are interested in this topic, but couldn’t join, just drop us an email to info@staburo.de ! Data analysis, clinical biostatistics and more.